Aries June 2015 Horoscope predictions indicate that planetary power is equal in both Eastern and Western halves of the horoscope. Hence your resolve will succeed at times while at other times you have to rely on others and seek their help. Home and spiritual issues will be in focus during the month. Career problems will have to be sorted out in June 2015 by strengthening your psychological abilities. Aries, you will be looking at your inner self and will find methods to improve your spiritual strength. You may search for new methods of meditation or spiritual cleansing. To improve your personal life and professional fields, you depend more on divine intervention. Arian businessmen will find their ventures moving at a slow pace in June 2015. It will be wise to concentrate on some important aspects of your projects rather than relationship with colleagues at your work place. The June 2015 Aries astrology predictions suggest that some financial dividends may occur abruptly. Your spouse and friends will help you in your fiscal projects. Money flow will require more effort than normal. Love matters will be unpredictable during this period for the Aries zodiac sign. Singles will find love in their business activities. Love can also happen in social get-togethers. If you have been dating for really long, then maybe you should think of marriage. Plans for pregnancy get a green signal in June 2015. 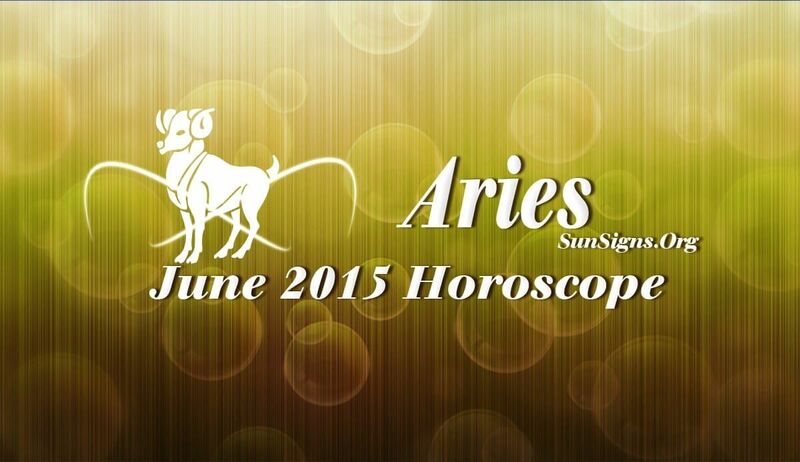 The Aries monthly forecasts for June 2015 predict that you will have sound health this month. Focus on having healthy food like eggs, tomato and broccoli in your daily diet. Slow down your speed in life after the third week of the month.